ドル円１時間足。下落なら77.50-60円付近からは値段が走るのか？/Dollar/Yen Hourly. If the market price may go down, 77.50-60yen around may work as pivot point. This is Dollar/Yen hourly rate. The intervention was occurred in this morning. Now, the market price can not go over the last high price 80yen and goes down side. In the last intervention, the market price goes one way from 78.40-30yen around. If it applies in this case, the market price may go one way from 77.50-60 around. We analyze Dollar/Yen Mid to long term tactics by weekly chart. 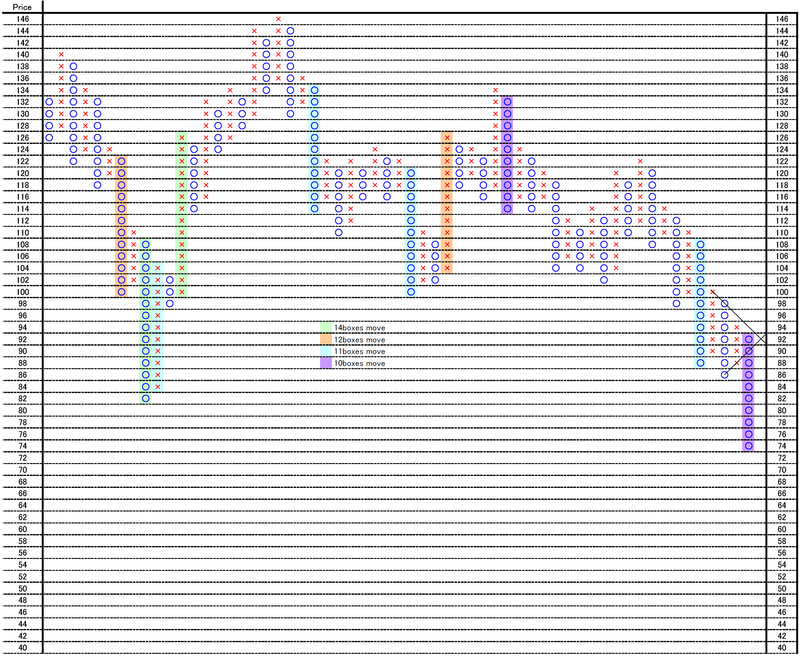 This is 5 yen price change and 3 box reversal close price’s Point and Figure chart from 1991. We consider two kinds of tactics. Tactics 1: Immediately or 70yen high may become reversal point. 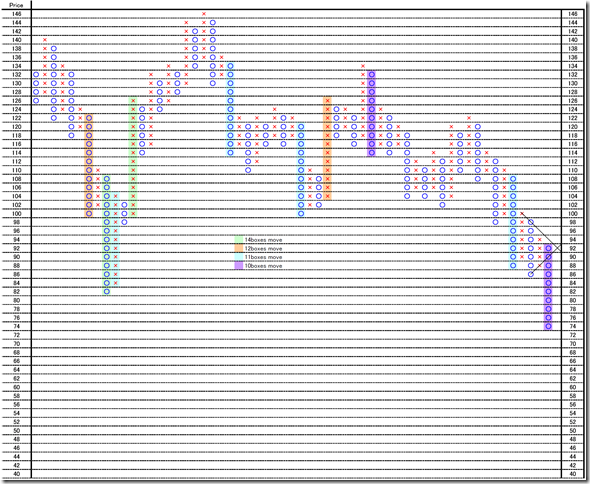 The market price move as after 5 boxes down side move, 3 boxes recover (A and B); immediately or 70yen high may become reversal point. Tactics 2: The market price may reach 60yen low. 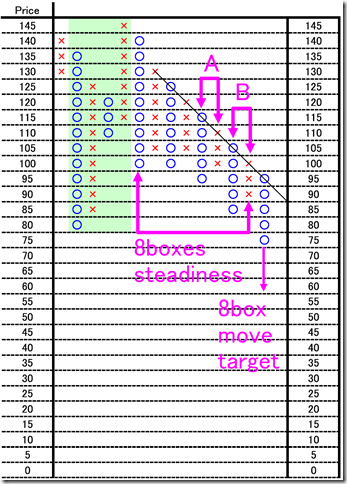 After 8 boxes steadiness, the market price may move 8 boxes. In this case, the market price may reach the level of 50 yen in short term. This is 2 yen price change and 3 box reversal close price’s Point and Figure chart from 1991. In this chart, there are 59 rows and ten and more over boxes moved to one direction was 10 cases. And maximum move was 14 boxes. 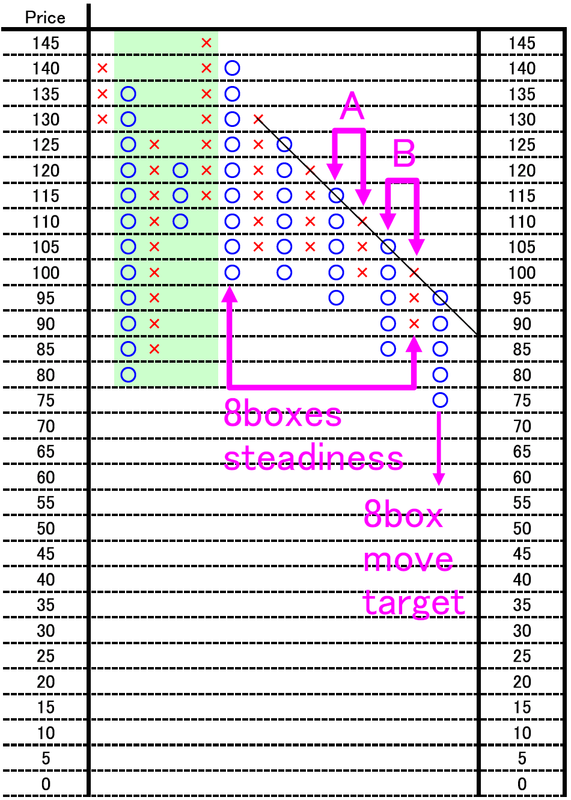 If the market price may move 14boxes, the target price may become 66-68yen. We can not predict the market, but we think reversal may occur sooner.